Hidden Loss – April Whole Group sessions. 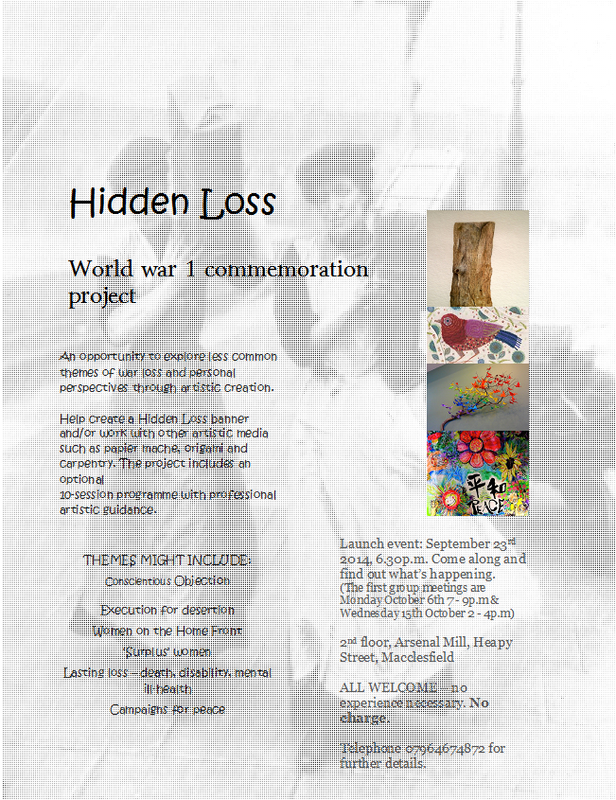 An opportunity to explore less common themes of war loss and personal perspectives through artistic creation. Help create a Hidden Loss banner and/or work with other artistic media such as papier mache, origami and carpentry. The project includes an optional 10-session programme with professional artistic guidance. Don’t forget you can drop in before this on Mondays 7-9pm and Wednesdays 2-4pm to work on your ideas. Jill and others come in most weeks to work on the project. ALL WELCOME – no experience necessary. No charge. Telephone 07964674872 for further details.